Propane fireplaces offer a convenient source of heat and provide a great ambiance. They burn clean, without the hassle of chopping up firewood or cleaning up ash. One of the most attractive features of propane fireplaces is that there's no need to worry about burning embers when you're done using it. With a turn of a knob, or a flick of a switch your fireplace can be shut off and the flame is out. Propane fireplaces can be purchased as free standing uits or as inserts for converting traditional fireplaces to propane. Know how to use and operate your fireplace. Eagle Propane Sales is more than happy to have a service technician explain and show the proper proceedures and operations of your fireplace. Always follow the manufacturer's safety instructions on how to use and operate your fireplace. The following is a general step by step instruction on how to light your fireplace. 1. Turn the manual shut-off valve of your propane fully open. If you don't open the valve, propane gas will not be able to enter the fireplace. 2. Turn your propane fireplace control knob couterclockwise to the "pilot" setting and hold the control knob in. The control knob is the knob that most often says "off", "pilot", "on"
3. With the control know held on the pilot position and pushed in, wait approximately 5 seconds, and while continuing to hold the control knob, press the iginitor button. The iginitor button will light the pilot, but you may have to press it serval times before it makes its connection. 4. After the pilot is lite, continue to hold the control knob in for approimately 45 seconds. After the 45 secnds is up release the control knob. 5. The pilot light should stay on when the knob is released (if the pilot did not stay on try again lighting with step 2) With the pilot light still burning turn the control knob to the "on" position and the main burn should come on or the thermastat can be turn up the control the burner. 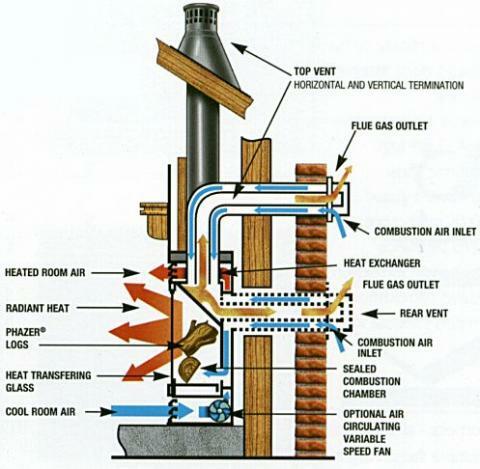 The following image shows how fireplaces work.